Note: Anyone can call themselves a Divorce Mediator because it’s an unregulated profession in the United States. Be certain to choose one that has formal training, experience and good reviews. is impartial and gives the same advice and information to both parties. You and your spouse can meet with the mediator as often as is necessary throughout the mediation process. Finally, once you and your spouse have agreed, you both sign a divorce settlement agreement and submit it to the court. there’s not a lot of animosity between the spouses. very importantly, is better when children are involved because they don’t see their parents arguing. The role of a Mediator is not to give legal advice. But an experienced Divorce Attorney can provide insight into possible negative ramifications of not coming to an agreement on a particular matter and going to court. This can give both spouses the extra incentive they may need to come to an agreement regarding a difficult issue. We know how to listen to both spouses, not dictate to you, and help you negotiate a mutually advantageous agreement of your own design. Our attorneys are also competent Business Tax, Bankruptcy, Wills and Trust and Estate Planning Attorneys who understand finance and are good with numbers who make sure your agreement covers all the bases. We’ll make sure your agreement is setup to endure predictable life changes so you don’t wind up in court later on. Arbitration is used when Mediation fails. The arbitrator is an attorney trained in the skills of arbitration. The parties can stipulate prior to beginning the arbitration that it is either binding or non-binding. Each spouse is represented by an attorney who will guide them through the process as they meet with the arbitrator. An arbitrator is bound by certain rules of the Uniform Arbitration Act. hold conferences; and sometimes subpoena witnesses. The Arbitrator’s final decision it is presented to the parties. The attorneys will then file a summary action, and the arbitration will be as enforceable as if it were a decision handed down by the court. Like the other alternatives to litigation, arbitration does require a certain amount of cooperation by the parties. whether there is a great likelihood for potential litigation. The overall costs of the divorce will likely be less if there are few marital assets and if there are no children from the marriage. Consider Collaborative Divorce instead of Mediation if one or both spouses are harbor animosity toward the other, there are questions regarding honesty, involves aggressive personalities, or marital assets are complex. Spouses entering into a Collaborative Divorce follow the “Collaborative Divorce Model”. Each signs an agreement to put for their best effort to resolve issues. If the process fails and the divorce goes to litigation, both attorneys involved in the Collaborative process must resign. 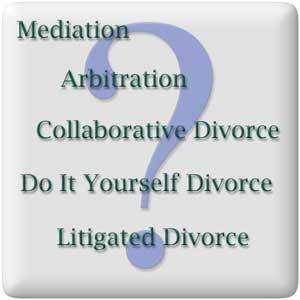 Mediation is non-adversarial because a neutral third party represents both spouses. Collaborative Divorces are adversarial because each spouse hires their own lawyer offering them legal advice and trying to negotiate the best possible settlement for their clients. Other professionals including accountants, therapists and consultants may be brought in to help resolve complex situations. All parties meet on a periodic basis until an agreement is reached. You may still need to appear in court to sign the final divorce agreement. The cost of a Collaborative Divorce usually falls between the cost of Mediation and a Litigated Divorce. However, if the Collaborative Divorce process fails and the divorce goes to litigation the entire process starts over again from scratch with new attorneys. So the total cost of the divorce may actually be much higher than if it had gone to litigation in the first place. Consult with our experienced Divorce Attorneys. They can gain a full understanding of your unique circumstances and the personalities of the spouses to help you determine the chances a Collaborative Divorce will be successful. Some couples try to save on legal fees by filing for divorce themselves without the help of a mediator, attorney or other professional. Self-help books help couples navigate the divorce process. You don’t technically need a divorce attorney, but unrepresented divorces are risky. Divorce involves complex legal matters, and you may find yourself without your fair share of assets or support if you divorce without professional representation. Future complications can be costly and far outweigh the cost of doing your divorce the right way up front. The old saying is true. People who represent themselves have a fool for a client. Litigated divorce is the “traditional” type of divorce whereby one party files for divorce and the process works its way through the courts. In most cases, couples reach an out-of-court agreement, although in some contentious cases, the case may end up before a judge. lastly, cases where considerable assets or complex financial situations are involved. How Do I Decide Which Divorce Approach is Right for Me? The first step is to realize the decisions you make while getting a divorce can affect your financial and sometimes emotional well-being for years or even the rest of your life. These are decisions you should not take lightly. The second step is to recognize the fact that you don’t know what you’re doing. You can read books and find online guides. This gives you some insights and explains the basic concepts of a divorce. But it doesn’t make you a Divorce Attorney. It takes years and thousands of hours to earn a degree and pass the bar. Furthermore, it doesn’t make you an experienced Divorce Attorney with specific experience practicing PA Divorce Law in Berks County. It makes a difference what state you’re in, what county your in within a state and which judge might hear your case in that county. Do it yourself divorces are incredibly risky. You think you’ve saved money only to be burned a matter you hadn’t considered years down the road. I have the experience you need to help you decide the best way to proceed with your divorce. have a reputation in Berks County communities around Reading for having unmatched family values. We will treat you the same as we would a member of our family. No one is better prepared to Mediate you Divorce. No attorneys are better prepared to represent you in a Collaborative or Litigated Divorce. No one is better able to draw on there experience to help you decide how to proceed to obtain a fast, fair divorce and the lowest possible cost. Contact Us Online or Call Us at 610-670-9000 today.